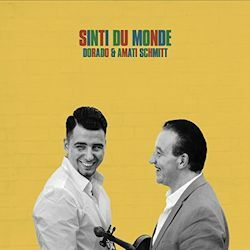 Released with very limited promotion in March 2016, Sinti du Monde is given a re-promotional push here. Dorado Schmitt has long been versed in the arts of Gypsy Jazz and his Jazz Manouche credentials are second to none in the metier. He plays both guitar and – less often here - violin and is joined by his guitarist son Amati (with a name like that he should be a fiddle player), Franco Rehstein and Esben Strandvig (two further guitarists) and bassist Xavier Nikq. Recorded without embellishment or overdubbing this is music of flair and character strongly predicated on that of the Quintet of the Hot Club of France. Whether soloing on electric or acoustic guitar Dorado Schmitt proves a worthy inheritor of Django Reinhardt’s legacy. His vibrato-rich soloing on Rose Room is full of virtuosic flurries, the tight rhythm propelling him with irresistible force. Whereas on acoustic guitar one can hear the nylon, rounded and colourful, as the crisp buoyant rhythm section animates Stompin’ at the Savoy. Three of the eleven tracks are his own compositions. For Francko is a slowly loping chanson with blues hues, beautifully textured, the soloist humming along, Ballade Romanez is slower and richly lyrical and rhapsodic, whilst Waltz for Esben - on which he plays violin – reveals his manouche fiddle style (far more Gypsy than Grappelli ever was) and moments of Classicism. After You’ve Gone hearkens back to the vitalising energy of the QHCF, whilst there’s a Latino slant to How High the Moon. Maybe it was my imagination that Je Suis Seul Ce Soir seemed to be recorded in a slightly different acoustic – or maybe the microphones were differently placed. Hayo Cue Cae is another relaxed rather sunny Latin piece where Dorado’s articulation and tone colours are very different to his manouche stylings. It reveals his care for apposite voicings and stylistic nuance. This beautifully recorded disc certainly more than deserves re-promotion. If you love manouche you’ll assuredly love this album.